First of all, I like the cover art on this book. The latest book by Christin Ditchfield, published by Crossway Books, is A Way with Words : What Women Should Know about the Power They Possess. Like Jaynes' book, Ditchfield speaks honestly and in a forthright manner to her audience. I think perhaps Ditchfield is a bit more gracious in speech and personality than Jaynes is. I'm not saying that to be negative. But I didn't feel like I was Ditchfield, whereas I felt an instant connection with Jaynes personality last year. At the same time, I felt Ditchfield drawing me up on a higher level and stretching my comfort zones once again. Another "pro" to Ditchfield's book is that she spends the later half of her book talking about speech in general - how to speak so that your words can reach the lost and win spiritual battles by speaking against injustice. "Scriptures says, "Rescue those being led away to death; hold back those staggering towards slaughter. If you say, 'But we knew nothing about this,' does not he who weighs the heart perceive it? Does not he who guards your life know it? Will he not repay each person according to what he has done?" (Prov. 24:11-12). I love how Ditchfield goes well beyond just reminding women that the words that they speak have an effect. She goes into scripture to remind us that words are a gift, a weapon, craftsmen, and we are to learn to use them well in a myriad of different circumstances. Ditchfield shares a good message here and it's one that women could really stand to hear. Just women? Or men too? Well, women statistically talk a great deal more and so they are her target audience. (That's not to say that men couldn't learn a thing or two from this read or consideration of the subject matter!) She urges women to put aside gossip, back biting, cruel speech and, yes, sarcasm when it's inappropriate and hurtful. We need to learn to put away lies and deceitful speech and to think on things which are true, right and beautiful. If we are thinking on what is true and right, then that is what will spill forth from our lips. There is so much more that I could say about this book but I'll stop there. I definitely recommend A Way with Words to you and would hope you'd take the time to read it! Thanks, Crossway, for allowing me a chance to dive on in! In the meantime, I am delighted to say that Crossway Books has offered one copy of this book to one Reading to Know reader. To win? Simply leave a comment below. This contest is open to U.S. Residents only and will be open through Thursday, September 9th. Wow, that sounds like a must-read. Guaranteed to make me squirm! That little sentence about sarcasm hit right at home! Throw my name in the hat. . . Um...I'm feeling convicted just reading your post. This sounds like a must-read for me. Please include me in the drawing. UGH! It sounds like a perfectly convicting-while-teaching book for someone like me. I blogged about your special week! Wow, this sounds great, Carrie. Very convicting :). I'm excited about your Montgomery giveaway, anything to get more people reading my all-time favorite author :). Will you have another L.M. Montgomery challenge. I didn't have a blog the first time around but would love to participate. Unfortunately, sounds like I could use this book! What a wonderful topic... One I would really like to read more about. I'm about to go blog again about your giveaway week because I think it's that great! Not being a words of affirmation person either, I totally understand what you mean. I think I need the book! This would be good for me to read, I'm sure. I agree with you about the cover art - it is different and catches y our eye. The topic of the book is something that I would love to read. I'm sure I could use this book. Nuff said. Sounds like a much-needed book. Please enter me. Words and the way we put them together have always fascinated me. I'd love to read this book. It sounds like a great book. I'd like to be entered, please. iamstumbeline(at)yahoo(dot)com Thanks for hosting this giveaway, Carrie. 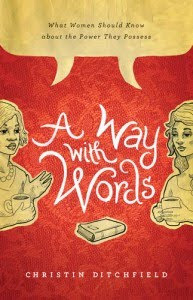 A WAY WITH WORDS sounds like a great book. Thank you for the chance to win a copy. I'd like to read this, please enter me.